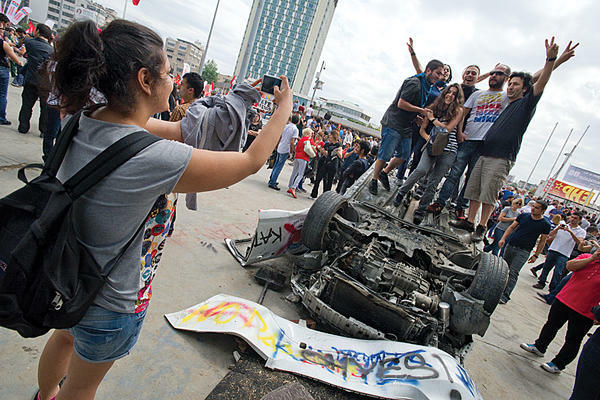 Since May 31, Turkey has been the scene of a popular uprising. As of June 5, numerous protests have spread across 77 of the 81 major provincial cities. More than a million people protested in the streets of Istanbul, hundreds of thousands in Ankara, Izmir, Adana, Bursa, and Hatay. The revolt grew rapidly after the Turkish police brutally attacked protesters in Taksim Gezi Park, an urban green space that the Metropolitan Municipality of Istanbul wants to demolish and replace with a shopping mall. The protests spread to the other cities in the following days as they have become popular upheavals against the increasingly anti-democratic AKP government. The masses won a partial victory when the police had to retreat from Istanbul’s central Taksim Square on June 1. Gezi Park has become a festive place where the protestors meet in solidarity and discuss the course of events. Clashes with police continue in other parts of Istanbul and in other cities. According to the Turkish Medical Association, 43 civilians were severely wounded and two protestors were killed as of June 4. Is this the Turkish Spring? Is Taksim the Turkish Tahrir Square? Not until the workers’ organizations actively take the lead. The left-wing labour union confederations, KESK and DISK launched a solidarity strike. And leftist protestors call for a general strike. Important meetings are held to mobilize the progressive, as well as conservative, labour unions that have issued timid statements, at best. There were numerous but fragmented strikes in several sectors and workplaces, like the Turkish Airlines strike, before the revolt. Uniting and politicizing these struggles with popular demands and helping the workers to initiate a strike wave remains a central task. Not surprisingly, the leadership of the biggest union confederations and of the largest unions are holding back. In Turkey, unions are organized on a national scale along occupational / sectoral lines. In most cases, there are two or three competing unions which are members of different confederations, and these did not actively support the protests as they are controlled by Erdogan’s AKP (Justice and Development Party). The labour bureaucracy is an obstacle in the path towards organized labour joining in the revolt and fostering a Turkish Spring. This is a popular uprising bringing together a wide range of people with different cultural backgrounds. The protesters are mostly young workers, mostly employed in the service sector, as well as students. Precarious workers and the unemployed are often visible in the front ranks. Since June 3, many high school students joined the protests. The energetic and creative character of the youth is visible in the way they use technology. Social media outlets have been very useful because all major TV stations first avoided covering the protest news, and then distorted it. For example, protestors communicate tips and tricks about how to reduce the effects of pepper spray and tear gas used by the police. They circulate lists of equipment needed. This is not merely a protest of and by youths though. People of all ages are in the streets, protesting. Clanging pots and pans protests are growing in the neighborhoods. Collective spirit is increasing in solidarity. People are building barricades in Istanbul’s historic streets. These scenes have entered the history books. This revolt is already among the biggest popular political actions since the coup d’état in1980 in Western Turkey. The nationally oppressed Kurdish people are familiar with huge protests. However, while many young Kurdish people are in the protests, the leadership of the Kurdish national movement does not actively support the revolt. That leadership could mobilize over a million people, in Istanbul alone, and could easily spread the movement to the cities of Eastern Turkey. But it is reluctant because it negotiated a so-called the ‘peace process’, ending the armed struggle in exchange for a series of democratic reforms concerning Kurdish national identity. Thus, it is an important task to link the Kurdish movement and its leadership to the revolt. The broad movement lacks a political leadership. In other words, no political organization in Turkey is ready to lead such a massive movement with a wide social base. The main opposition, CHP (Republican People’s Party) is a bourgeois party. It supports the movement against Erdogan’s AKP. More specifically, it’s decision to cancel its previously arranged mass demonstration set for Taksim was a significant factor in the police retreat from the square. 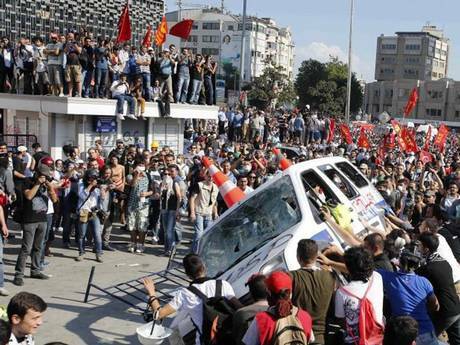 But the CHP is concerned about the protests posing a challenge to capitalist rule. This was the worry when the Istanbul Stock Market crashed on Monday, following the flight of short term foreign capital. CHP softened its rhetoric and joined the chorus warning the masses against ‘marginal groups’ and ‘provocations’. Nevertheless, CHP leadership does not fully control the militants in its rank and file. There is a huge possibility that its militants will to break away from the bourgeois CHP if the revolt advances. The movement embodies a strong secular outlook. There has long been a tendency to equate secularism with Kemalist elitism and anti-democratic militarism. But now, the links between democracy, freedom and secularism are being re-established. Although some segments of CHP and the ex-Maoist (now Eurasianist) Workers’ Party (Aydinlik) raise pro-military and Kemalist slogans to appeal to secular people, secularists seem to be slipping from their grasp. That said, seeing many portraits of Mustafa Kemal, and hearing chants like “we are Mustafa Kemal’s Soldiers’ is no surprise. The banners of ODP (Freedom and Solidarity Party), EMEP (Labour Party), TKP (Turkish Communist Party) and the other left organizations now decorate Taksim Square, displacing commercial signs. However, these parties are small and they are far from leading the movement. In numerical terms, the largest left party is TKP. Like its sister party in Greece, the KKE, TKP followed a sectarian path until the revolt. For example, when thousands were fighting with the brutal police to try to gather in Taksim Square, the TKP held its own May Day rally in a different square. TKP militants are now with the masses. This illustrates a historical tendency for the rise of mass movements to marginalize sectarianism. Socialist militants are more vocal than ever. They feel less isolated as millions join them in chanting their slogans against the AKP’s authoritarianism. For many, this is their first political action. They are receptive to new ideas, including the socialist ones. Nevertheless, Foti Benlisoy (activist and blogger) warns against sectarian agitation, stressing the importance of practically engaging in the concrete issues now facing the revolt. The revolt in Hatay has a particular significance, and not only because the police killed a young militant there. Hatay is near the border with Syria. Its residents are increasingly affected by Erdogan’s war drive aimed at Syria. Only a couple of weeks ago, many died in a terrorist attack, which is thought to be a consequence of Erdogan’s aggressive foreign policy. Currently, Erdogan is on a tour of North Africa. In his absence, AKP officials, and President Abdullah Gul, who used to be an AKP big shot, half-heartedly apologized for the police brutality. The bourgeois press shifted gears. It now tries to calm the masses, instead of simply ignoring them. However, the business media increasingly point fingers at the so-called ‘marginal groups’ and ‘provocateurs’. Videos of non-uniformed cops with clubs attacking people illustrate who the real provocateurs are. On June 5 scores of young people were arrested — for sending twitter messages. If the movement loses momentum, there is a risk of heightened repression. The police can target and arrest key militants like their counterparts did in the aftermath of the Quebec student strike in the Fall of 2012. The revolt is far from being over. Already it has enabled the masses to realize their political power. It is now at a crossroads: its demands can be co-opted by the bourgeois rulers (which is the current trend) and remaining protesters can be marginalized Or the revolt can regain its momentum by challenging not only the rule of the AKP, but the corporate agenda. Its success depends on engaging organized labour and the Kurdish national liberation movement. This popular uprising underscores the urgent need for an independent mass labour party in Turkey. It demonstrates how obstructionist the corrupt labour bureaucracy can be. If the working class had its independent and organized political voice, this revolt could grow enormously and effectively to challenge the rule of capital. This popular upheaval also demonstrates that social/political revolt is not a thing of the past. And when revolts begin, time accelerates! Turkey is already a different place than when my plane landed at Istanbul’s Ataturk Airport on May 30. But such upheavals require a revolutionary leadership equipped with the knowledge of history, and the experience of social movements, and a concrete programme and strategy, in order to claim political power and abolish capitalism. As we say to our friends in Canada, and around the world, such a party should be built prior to the revolts, because during a revolt there often isn’t sufficient time to build the necessary party capable of uniting protesters around radical demands and leading them forward with correct tactics and a revolutionary strategy for power. The revolt is in its essence a movement against the neo-liberal Islamist AKP, which has an anti-democratic character suited to ruling in the context of the present crisis of decaying global capitalism. Since capitalism is international, so should be the class struggle. Supporting the Turkish revolt is a part and parcel of building the international struggle against capitalism. Workers and youths across North America should realize that this revolt is not merely about defending a public park. It has a great potential to become a mass movement aiming to take political power from the 1 per cent, by and for the 99 per cent. It can bring anti-labour Erdogan down if organized labour whole-heartedly supports the resistance. Workers in North America should demand that their organizations actively support the revolt. The progressive unions in Turkey need solidarity, and the conservative ones need to be pressured to act in the interest of the working class. Turkish communities in major cities across North America organized solidarity demonstrations. Kurdish communities should be encouraged to participate with their just demands. Any form of Turkish nationalism will alienate the Kurdish people. Demonstrations should aim to put pressure on the Turkish state to halt the repression, release political prisoners, and meet the demands of the mass movement. In this framework, youths and workers, together with the Turkish and Kurdish communities in North America, should picket Turkish embassies and consulates.